Federal Middle District of Pennsylvania Judge Malachy E. Mannion recently granted a motion for partial summary judgment in favor of the defense in a bad faith claim brought under 42 Pa.C.S.A. § 8371 arising out of an underlying UIM claim pursued by a limited tort plaintiff. In the bad faith case of Miezejewski v. Infinity Auto Ins. Co., No. 3:12-1000 (M.D. Pa. Jan. 22, 2014 Mannion, J.) (mem. ), the court granted a carrier's motion for partial summary judgment where the primary issue presented was whether it was bad faith for the UIM carrier to not include plaintiff's wage loss claim in its damage calculation. The limited tort plaintiff also asserted that the carrier acted in bad faith by failing to review the first party benefits file, failing to request permission to speak with the plaintiff, failing to review pre-accident medical records, and failing to give any value to plaintiff's wage loss claim. After reviewing the record before the court on the motion, Judge Mannion found that the plaintiff never demanded that defendant review the first party file and that the plaintiff never established what was in the file or how it would have affected the outcome. The court also noted that the insurer's failure to request permission to speak with the plaintiff was not bad faith as the insurer was aware of the plaintiff's position from regular communications with plaintiff's counsel. The court noted that, under Pennsylvania bad faith law, there is no legal requirement that insurers conduct perfect investigations. Ultimately the court ruled in Miezejewski that, based upon the case presented, the insurer had reasonable bases to make the increasing offers it made and to inquire further into plaintiff's prior medical condition and wage loss claim particularly where some of the medical records revealed pre-existing issues, and employment documents established that the plaintiff continued to perform her job one year post accident until being terminated along with four other workers. 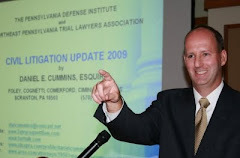 Anyone wishing to review Judge Mannion's Opinion in the bad faith case of Miezejewski may click this LINK.